For most people in Christendom Joseph is a minor character in the birth narrative of our Lord and Savior Jesus Christ. He is the figurine that we place beside the manger opposite Mary in our nativity sets we display at Christmas. There are also some figurines that depict him leading a donkey upon which sits the Virgin Mary. Few will think of St. Joseph in the coming year, unless they attend a school that bears the name, or you happen to be a carpenter or in real estate (patron saint). Now, to be fair, there are St. Joseph house selling kits that you can purchase. They contain a small statue of St. Joseph that you bury in the yard of the house you want to sell. 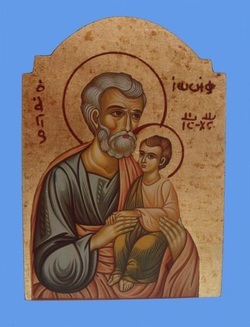 There is a prayer to St. Joseph, requesting his assistance, which may be read as he is placed in the yard upside down. (I don’t know why.) When the house sells, the instructions tell you to remove the statue and place it in your new residence in a place of prominence and honor. Alas, I dug one up while planting shrubs at our house (hardly a place of prominence). In scripture Joseph does disappear early. We last see him in the temple searching for Jesus when the boy was twelve years old. Most assume that he died sometime between then and when Jesus started his public ministry. Without his name before us in the scriptures, it is easy to neglect his contributions to the salvation story that is unfolding before us. When an engaged (betrothed) female becomes pregnant before she has moved in with her husband to be, she is in great peril. This is especially true if the husband to be is not the father. She could be exposed to shame, disgracing herself and her family. She could even be stoned to death as an adulterer. Joseph, being a good, decent and righteous man was going to have Mary put away quietly, so that there would be no public shame. After an angel spoke to Joseph in a dream, he understood that the child Mary was to bear would be the savior. Joseph believed that the child was of the Holy Spirit of God and proceeded to take Mary into his home as his wife. He did more than just stand beside the manger in adoration. He was there for Mary, assisting her with the birth. He took care of Mary and provided for her and this baby, not just on this holy night but every day of his life. He took them into Egypt to protect them from Herod. He took them home to Nazareth after Herod’s death. There he provided for his family and did his part in raising Jesus. While Joseph was not the biological father of Jesus, there can be little doubt that he had a tremendous impact on Jesus’ life. Joseph helped teach, mold and guide the child, until his life’s end. This side of heaven we will never know the extent of his contributions to the life of our Lord. At Christmas let us at least remember the faithfulness of Joseph. He was the second person to be let in on the secret of what God was doing, and he committed his life to it. He was faithful, and he was the only person there to welcome Emmanuel into our world. Like him, may we be faithful and commit our lives to this unfolding story. May we, like him journey to Bethlehem to welcome Emmanuel into our world. blest earth with welcome light.